The Google Pixel 3 is an expensive smartphone, which retails for US$799 (£739). However, it must compete against comparably equipped but considerably cheaper competitors. Find out in our detailed review whether Google has corrected the issues we had with the Pixel 2 and how the company’s new flagship fares against its competitors. These days, practically every phone maker is desperately trying to do something extra, whether that means slapping five lenses on the back or developing a fancy new way for a camera to pop out of metal. Bucking that trend, Google made its phone more useful for the types of things you'd more likely demand from your phone. The Google Pixel 3 definitely earns its place among the high-end mobile cameras. What is most impressive is how Google’s software has improved upon the Pixel 2, while using very similar camera hardware. As such, the Pixel 3 is the best single-lens camera, and possibly the last single-lens system at the high-end. Nonetheless, if you enjoy a smartphone that gives you a that Google “Smartness”, great performing camera system and unbeatable audio and visual experience, and also if you do not care about bezels, the Pixel 3 is the way to go. After letting the Pixel 3 XL’s mature for several months, the majority of its bugs disappeared and it comfortably became my daily driver. But how does it perform when it came to travelling overseas? On top of not getting lost and being foreign to the local language, the last thing you would want to be causing problems is your smartphone. Additionally, as someone who takes a ton of photos when travelling, its camera will also be one of the main aspects that will be discussed. The Pixel 3 and Pixel 3 XL aren't perfect. But from a features and software standpoint, I do think Google has knocked it out of the park again. This is also a time where something approaching design fatigue is becoming increasingly obvious, and a lot of flagships phones are starting to look uncannily similar to each other, and to their predecessors. Software is one of the areas where companies can continue to throw in fresh ideas and innovate, and Google is doing this wonderfully. The Pixel 3 phones may not be the swankiest kids on the block, but they deliver where it counts. And sometimes, maybe substance matters more than flair (if you don't mind the high cost). Google Pixel 3 is not for everyone. Usually, when someone asks me which phone they should buy, I simply point them towards the OnePlus 6T. It’s just better value. But these little things are what set the Google Pixel series apart, and for most buyers, they’re not enough to justify the massive price difference especially in countries like India. And I agree. However, if you’re looking for a premium experience, I can assure you the Pixel 3 won’t let you down. If you're shopping for a top-quality smartphone, this fits the bill. But the price will make you consider keeping your old one. If you're looking for a no-nonsense Android smartphone that you can rely on then the Pixel 3 is a top choice. It's worth bearing in mind the the XL model offers a very similar experience, but with a larger screen (including a notch) and bigger battery. If you’re in the market for a new smartphone, the Google Pixel 3 is a fantastic device, especially when taking into account newer features like Night Sight. If you’re still rocking a Nexus or original Pixel device, the Pixel 3 will be a great upgrade. The Google Pixel 3 is definitely an improvement over the Pixel 2 smartphones. However, most of the features have come, or will be coming, to the Pixel 2 and 2 XL as well so it is a bit harder to justify an update unless you really want or need the latest and greatest Google has to offer. That’s the Google Pixel 3 and Pixel 3 XL in a nutshell. Where the company boasted that it had made “the best camera” in last year’s Pixel duo, this year’s rhetoric was lowered in place of visual proof. Overall, is the Pixel 3 a worthwhile phone to purchase? The problem here is I think unless you’re very entrenched in Google’s software ecosystem and you make good use of many of Google US-exclusive features on the Pixel, then you might want to consider some other alternatives or just wait out the next generation from the big vendors. Google’s release schedule, which is out of sync with SoC vendors, means that the Pixel is again a half-way point between generations. On top of that, Google is demanding the full price of a new flagship, while lacking some of the features or build quality of said flagships. Pixels have always been niche phones - in fact, since before they were even Pixels, though admittedly the Nexus line was niche in a different way. The number of Pixel 3s sold will very likely be a fraction of the major competitors' figures, but does that make the Pixel 3 a bad phone? The Google Pixel 3 and Pixel 3 XL phones are not without their issues, the notch is annoying but can easily be hidden with an app if that is your whim or just left in full view (yes, you do get used to it). just like so many other phones. It is hard to question Google’s intent behind making the Pixel 3. The vision is to make a flagship Android smartphone that is backed by Google AI, which is fast and slick, and where software takes a center stage. The Pixel 3 comes close but it is still not a perfect device. The camera is its biggest merit, the screen looks good, the front-facing speakers are loud and the battery is good if not the best. Overall, I believe the Pixel 3 is the right phone for geeks and early adopters, but it’s still not ready to be a mass premium seller like the iPhone XS and Galaxy S9. There has always been something different about Google’s Pixel series. When it debuted in 2016, it felt like Google was content to run its own race, slow and steady, forging a path away from everyone else. Rather than impress with glitzy hardware, Google played to its strengths by prioritizing powerful machine learning. The Google Pixel 3 manages to get almost everything right, including the way it gets out of your way when you don't need it. An Amazing display, camera, and performance mixes well with awesome sound, water resistance, stereo speakers, and a lovely, minimal design. Plus the best of Android before anyone else. The Google Pixel 3 has all the goodness of a Google-designed phone, which includes advanced software processing for the camera, the latest firmware and security updates, and some handy tricks (Now Playing on the lock screen and Digital Wellbeing monitoring). Last year, I wrote that the Pixel 2 was an excellent camera, but an incomplete one. The Pixel 3 is a more complete camera this year, but still not a very well-rounded one. The Pixel 3 and Pixel 3 XL aren't perfect. But from a features and software standpoint, I do think Google has knocked it out of the park again. This is also a time where something approaching design fatigue is becoming increasingly obvious, and a lot flagships phones are starting to look uncannily similar to each other, and to their predecessors. Software is one of the areas where companies can continue to throw in fresh ideas and innovate, and Google is doing this wonderfully. The Pixel 3 phones may not be the swankiest kids on the block, but they deliver where it counts. And sometimes, maybe substance matters more than flair. Google Pixel 3 Camera Review: A “New way to see the world” indeed! The Pixel 3 proves that you do not need multiple cameras to take great photographs. Which is why it goes right up there with the best in the phone photography business, in spite of seeming to be relatively modestly specced. No, it is not perfect. It can be erratic. It can be inconsistent. And sometimes it can deliver results that border on the unreal. The Google Pixel 3 takes what's good about the iPhone and applies it to Android. Whether you think that's a good or a bad thing, the Pixel 3 needs to be experienced to be fully understood. It is one of the best Android phones you can buy right now and quite possibly has the best camera available. What I will say is that I would be perfectly happy with the Pixel 3 or XL. And I was impressed with the Quick Switch Adapter (USB-A female to USB-C) and software that transferred everything from my Note9 very efficiently. It also works with iPhone, Blackberry and Windows Phone transfer. In Android to Android transfers the worst it will ask for is a password to activate the app, (e.g. email etc.). Overall as a phone, the Pixel 3 is as pure an Android experi ..
Like all Google phones that came before them, the Pixel 3 and Pixel 3 XL offer an experience that goes well beyond hardware specs. The phones sit on the cutting edge of the Android platform, and represent Google’s vision about the present and future of its own mobile ecosystem. If you are shopping for a new Android phone, you need to have these two on your shortlist of options. One last thing to remember: Verizon is the exclusive carrier of the Pixel 3 and Pixel 3 XL in the US. That’s not a change from previous years, but it’s something to be aware of if you like the device but have a different carrier (meaning: Buy the unlocked version). These are not radically different phones from last year's Pixels, but they are much nicer to use and remain the most pure Android experience you can get. That might seem weird to say when some vendors are equipping their phones with even more stripped back "stock" Android software, like HMD with its Nokia smartphones, but the difference is that Google's additions support and enhance Android Pie while keeping the whole thing minimal and fast, not beating you over the heady with glitzy features. Like last year, this is the best Android experience and camera you can get, but this time it's wrapped up in an overall better machine. The Google Pixel 3 will run you $799 to start and $899 for the Pixel 3 XL. This will get you the 64GB storage models with another $100 bump up if you want 128GB. In the box besides the phone, Google this year has included a pair of wired USB-C headphones that have the same look as the wireless Pixel Buds. These headphones can be used with Google Assistant, and do live translation like the Pixel Buds. Both models share the roughly the same specs with only the battery being bigger on the Pixel 3 XL and the Pixel 3 speaker sounds being about 10% less than the XL. 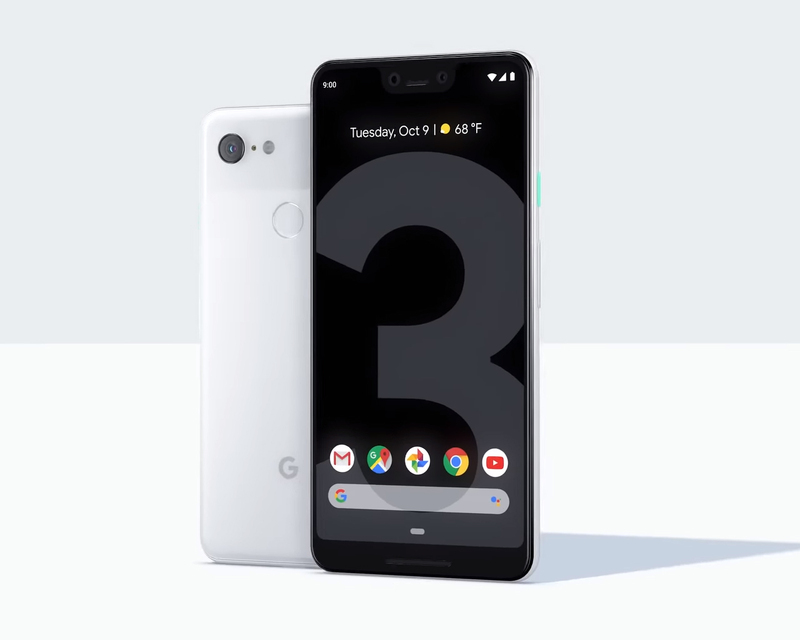 The Pixel 3 series is not available for pre-order now and both models come in Just Black, Clearly White, and the new Not Pink. We’ll have more about the Pixel 3 as we next talk about the new Google Pixel Stand. The Pixel 3 might not be the most exciting upgrade in the history of phones, partly due to the excessive leaks perhaps, but it's a great device made even better with refinements at a reasonable price. Overall, the Pixel 3 and Pixel 3 XL are a marked improvement over last year's models and from what we can see, they don't really have any deal-breaking flaw other than very high price tag. They are well-built, look great, have solid performance, and continue to shoot amazing photographs, thanks to great software. If we were to pick our favourite of the two, we'd recommend getting the Pixel 3 XL over the Pixel 3. The bigger battery and the larger, higher resolution display simply makes for a better experience. The Google Pixel 3 and Pixel 3 XL will be available in India starting November 1. The 64GB Pixel 3 is priced at Rs 71,000 whereas the 128GB Pixel is priced at Rs 80,000. The Pixel 3 XL starts at Rs 83,000 for the 64GB variant and the 128GB variant is priced at Rs 92,000. The Pixel 3 has a 5.5-inch display whereas the Pixel 3 XL has a 6.3-inch display. For me, it’s more than worth it. I would pick the Google Pixel 3 and Pixel 3 XL not only over most other Android phones, but even over the latest iPhones (even the iPhone XS and iPhone XS Max, which are far more expensive). But I’m also highly invested in Google’s ecosystem, I’m a sucker for little details like the soft touch back, and I have a near compulsive need to use Android the way Google intends it. The Pixel 3 doesn’t stand out in any specific areas - and lags behind in one or two - but what it does do is bring together all of its functions to form a whole that feels genuinely smart, deploying clever AI and software tweaks to create something that’s genuinely useful. Be sure to check back soon for our full Google Pixel 3 review after we’ve had some more time with it. In the meantime, let us know what you think about the new Google Pixel 3 and 3 XL in the comments below or on Google+, Twitter, or Facebook. What isn’t up for question is how polished the overall experience is for both devices. Last year’s Google phones showed us just what the company could do with software. Now, the Pixel 3 and Pixel 3 XL wrap that in a far more premium-feeling design, and feel all the more cohesive as a result. Pricing here is somewhat competitive as well. The Google Pixel 3 and Pixel 3 XL start at $799 and $899, respectively, for the 64GB models. That’s not cheap when you consider phones like the One Plus 6 are available for hundreds less, but in the overall landscape (and certainly compared to Apple's iPhone XS), the new Pixels aren’t the most expensive flagships either. Ultimately, Google seems to have balanced things nicely with the Pixel 3 and Pixel 3 XL. If you’re in the market for a new smartphone, do yourself a favor and check them out. We only have three years of Google-made phones to look at, so it’s too early to tell if the company is going to fall into an Apple-esque pattern of alternating between big, flashy phones one year and “S-year” updates the next. But to me, the Pixel 3 and Pixel 3 XL are quite a bit like the S-year iPhones. There's not been a moment where the Pixel 3 hasn't surprised or delighted with some aspect of its user experience. Google’s Pixel 3 and Pixel 3 XL are not the most revolutionary smartphones to come out in 2018, nor are they among the most interesting. They are what Google has always envisioned them to be - minimalist, fast, secure and great at capturing outstanding images. After days weeks months of rumors, leaks, and a whole lot of hype, the Pixel 3 is finally here. It’s hard to believe we’re already at the third anniversary of Google’s emergence as a true hardware company. Time flies, as they say. Much of the interest in the new Google Pixel 3 and Google Pixel 3 XL (I’ll just use ‘Pixel 3’ through the article to keep it simple) has to do with the improved camera setup, mostly because the Pixel 2’s camera was so great. Many consider it to be the best in the business, and some would even say it’s even better than the recently launched iPhone XS (please argue in comments appropriately). 95% Google Pixel 3 : des photos parfaites et un Android pur dans un boitier tout en douceur ! Prise en main du Google Pixel 3 : à la hauteur des attentes ?